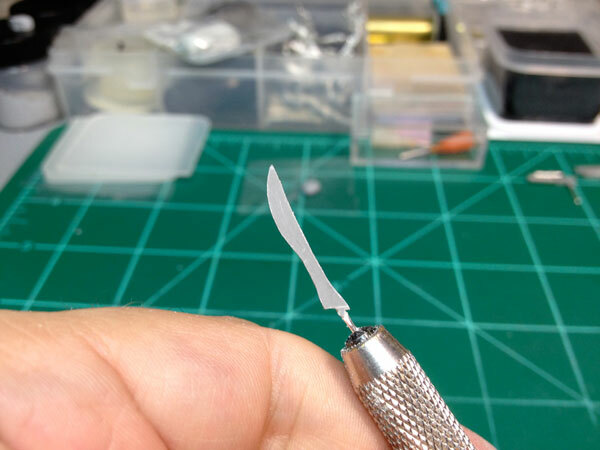 In Session 1 I created the blank for shaping the blade for Linna's sword. After the putty has cured, it is now shaped and detailed out. I trim down the blade and roughly carve out the shape. 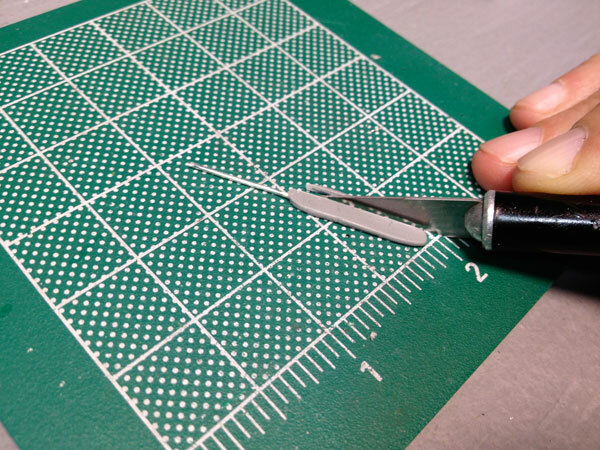 In this case, Linna's blade is curved, so I try to cut sections of it to block it out. 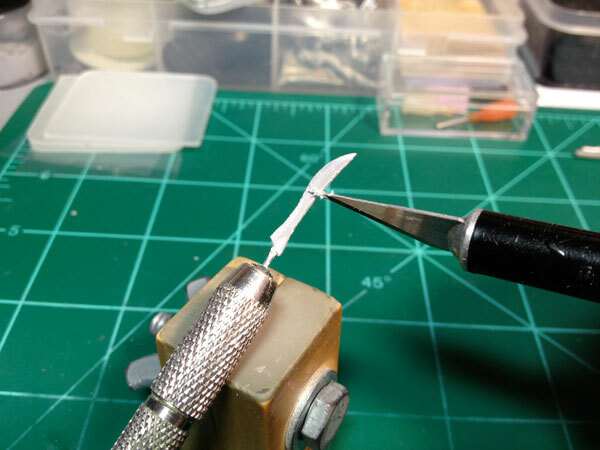 Here I check the blade agains the figure again to make sure it is the right size. 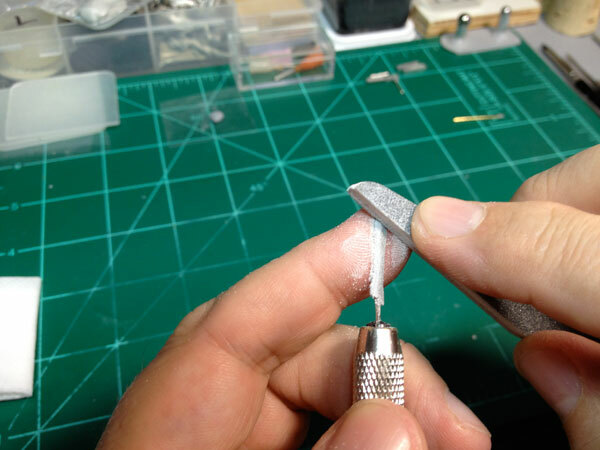 Next, I clamp the wire for the blade in a pin vise and using a 180 grit sanding board, file the edges of the blade. 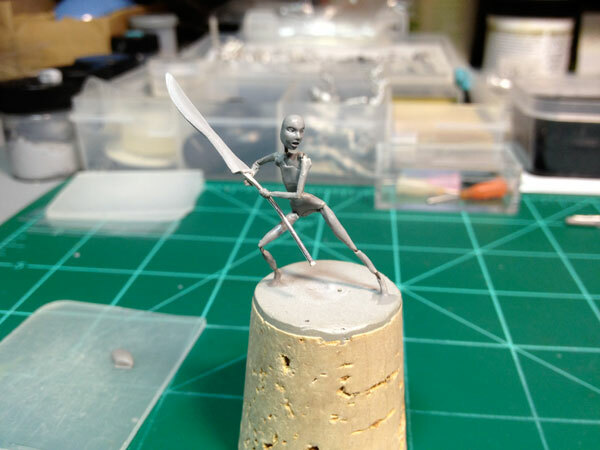 Here is where I will refine the silhouette of the blade and shape all the curves to make sure they are even. 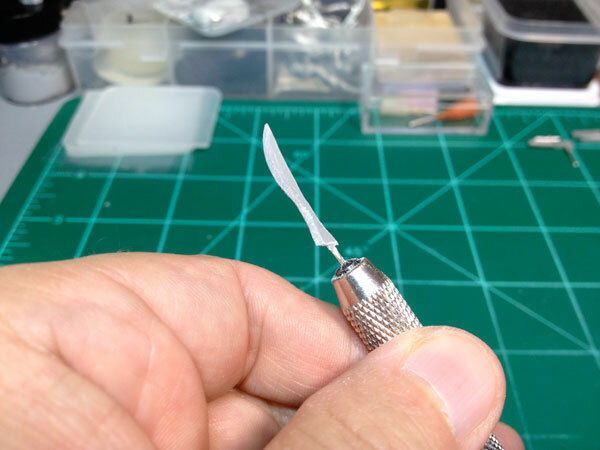 This is the basic shape to the blade I'm looking for. I hold the sanding board at an angle to bevel a keen edge to the blade. I check all angles of the blade to make sure they are symmetrical where necessary. If anything is out of balance, I sand a little more on it until it looks right. You have to be careful not to sand off too much material. If you do, you have to add more putty to the area, cure it, and reshape. After all the basic sanding is done I scrape down the surfaces with a fresh knife blade. This is done with smooth even strokes very lightly. You only want to remove enough material just to smooth out the surface where it was roughed up from the general sanding. The size and shape of the blade are checked again. If it is too large or not balanced it is back to sanding and scraping. Next, I add the hilt and any crossbar or decoration. For this sword, there is only a bit of decoration around the hilt. 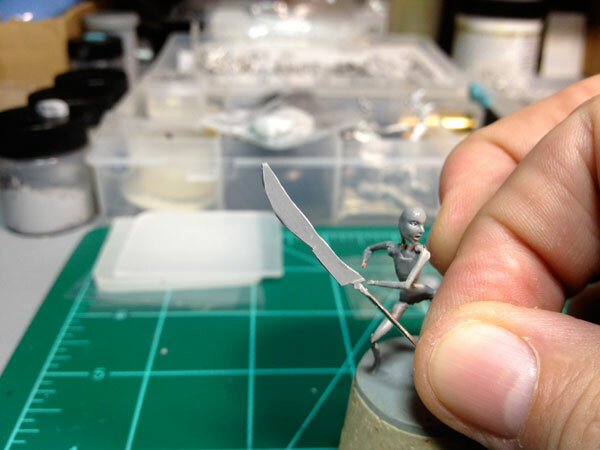 If this were another blade with a crossbar, I would form the crossbar by adding a couple of "sticks" of putty off each side of the blade as an armature, cure that, and then sculpt the crossbar detail over that. 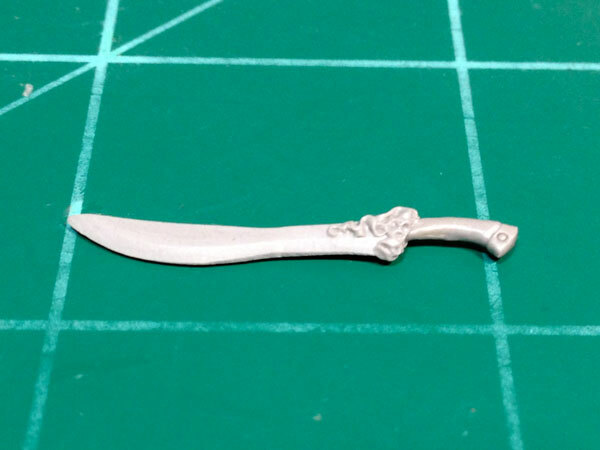 Here is Linna's completed sword. Next I move on to sculpting Linna's Anatomy. 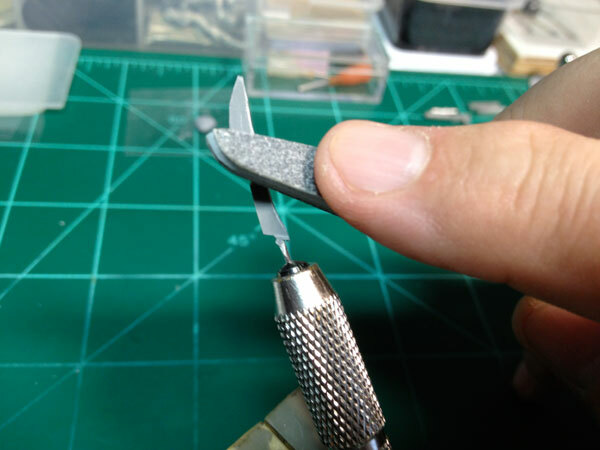 You can discuss the process or ask questions in the Workbench Forums here. 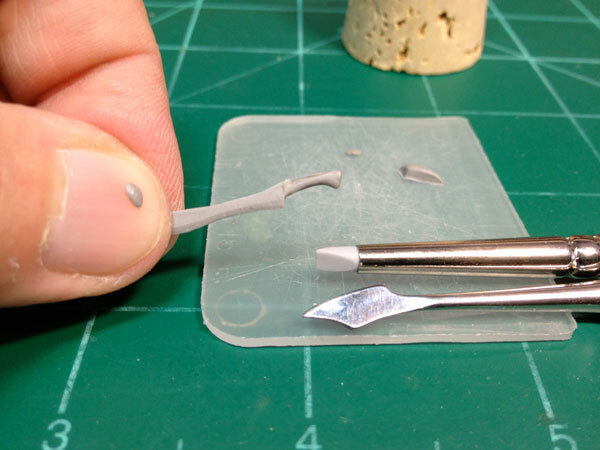 To read more about the various sculpting materials, their properties and cure times, see the section on Sculpting Putty.